This is the number one ranked handicap on the course; it is slightly downhill, guarded by large bunkers on the front left and on the right. The green slopes back to front for an added challenge. This is one of only two par 4’s on the course, with trees and homes guarding the right side of the fairway. This hole is drivable for the longer hitters. This is a short, appealing par 3 guarded by tall trees on the right and a large bunker on the left. This is a short uphill par three with a two-tiered green and water to the right. A very short par 3 that runs a narrow green sloped left to right, with a large bunker guarding the front of the green. This slightly uphill hole has trees that overhang and guard the green; you’ll find out-of-bounds down the right. A par 3 with trees lining the right and a very large bunker behind the green; you’ll find out-of-bounds down the entire right side. This is a downhill par three with large bunkers front right and back left of the green. This hole is a long downhill par three with out-of-bounds to the right. The green slopes severely from back to front and is guarded by a bunker front right. You’ll find this hole to be a short uphill par three to a two-tiered green. The undulating green is protected by a bunker in front. Be careful - if you hit the telephone wire, it’s a do over. This is a par three with trees to the left and the right. The spacious green is guarded by a large bunker on the left and another one front right. Here you’ll find a short par three with large bunkers on the right and the left. This is a short par three, so club selection can be difficult. The second of two par 4’s on the course, you have a narrow tee shot to a sizable fairway. A large lake with a fountain guards the front left of the green; the green is quite sizable and slopes back to front, adding to the challenge of this hole. This short par three is guarded by a bunker on the left side. The green is the most severe on the course, sloping from back to front. This hole is a short par three to a green surrounded by trees and bunkers. Par three to a large green protected by a huge bunker on the right side. This is our signature hole. The tee shot is over water to a green protected by two bunkers to the right. The large spacious green slopes back to front. Power Carts are available for $10 per rider and Push Carts are available for $6. Spectators must be 11 years of age or over to have access to the golf course. 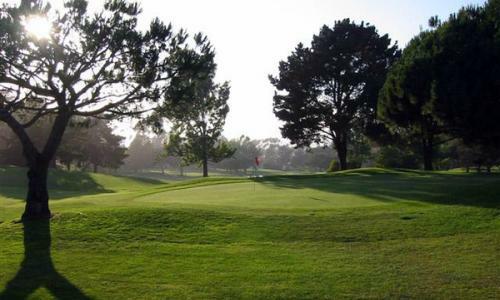 Designed by famed golf course architect William Bell in 1973, Lomas Santa Fe Executive Golf Course in Solana Beach, near San Diego, is a challenging short course that’s great for beginners and for more advanced players who want to work on their short game. This 18-hole course measures 2,404 yards and features impeccable greens, tree-lined fairways, ocean views and mild weather year-round. To perfect your game, Lomas Santa Fe Executive Golf Course provides a putting area for practice, and a fully stocked Pro Shop to ensure you have the best equipment—everything you need for an exceptional golf experience.